Three weeks was not long enough. We are not tired of London and we are certainly not tired of life. This city has been called a modern Babylon, a populous and smoky city where no one is ever healthy, a place for love and scandal, the epitome of our times, going beyond any boundary or convention. Illimitable infinite London. And to us for the last three weeks, home. As this is our last day in Londontown, what better way to capture the spirit of this city than to relive three of our favorite experiences. Emma's attempt at opening a soft-boiled egg. Fail. The pubs. Ahh, the pubs. 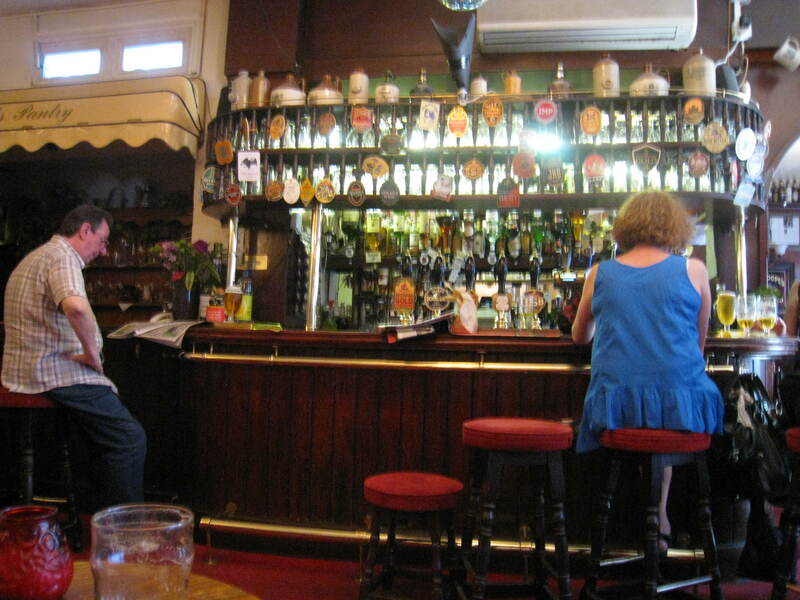 I have said before that my favorites pubs in London are The Harp, The Jerusalem Tavern, Ye Olde Mitre, The Market Porter and The Wenlock Arms. What these boozers have in common are high-quality real ale (and often ciders and perrys), friendly, knowledgeable bartenders and comfortable surroundings (perhaps with the exception of The Market Porter – I have yet to find an available chair there.) Added to this illustrious list is The Pride of Spitalfields, a pub that I am proud to say became our local. While The Pride is small and doesn’t have a wide array of real ales (it did have Crouch Vale’s Brewer’s Gold, which was quite hoppy but with that delicious honeycombed English malt, Sharp’s Doom Bar, Fuller’s London Pride and ESB, all in good nick,) it does have witty and charming regulars, plays music (which is often unusual in pubs, as are TVs) from The Cure to Ce Lo Green and has comfy red plush banquettes dotting the dingy carpet. Plus what other place has a disco ball at the ready?! Located on a small street off Brick Lane, The Pride attracted a motley crowd the handful of times that we were there – blue-collar, suits and what I heard termed as the “Kajagoogoo lot.” Honest to god, it was a flashback to those bad 80s New Wave hair days. We did close down the pub twice with our New York and London friends. I can’t say that this endeared us to the regulars but I can safely say that we will be remembered. 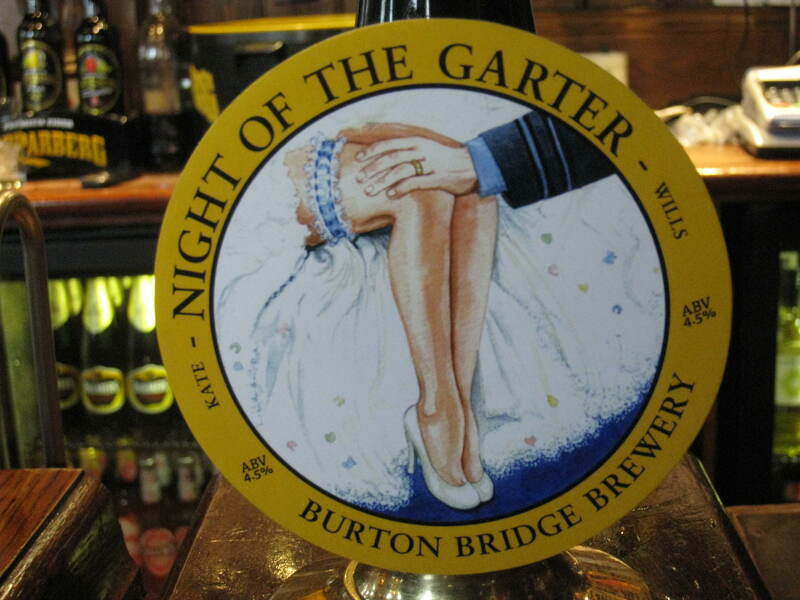 Night of the Garter Ale. How cheeky. Lastly, the Royal Wedding. I hesitated to write about this since there has been an oversaturation of pictures and analyses of this event. But it was a big one, and we were here for it. Rather than focus on Kate’s dress, Pippa’s figure, Will’s uniform, Harry’s scruffy hair, the carriage, the car, the spectacle, I prefer to focus on the commonplace and universally appreciated aspect of this extraordinary event: the bottom line. How did this city make a quid on Kate and Wills? What were the creative ways businesses parlayed the wedding of the century into a profit? Well, we saw special ales with cheeky names brewed for the occasion (see pic above), a tanning salon imploring us to “Tan Like the Royals” (they were pretty pasty last I checked), even soaps bearing the name of William and his English Rose. Restaurants and pubs asked us to “Watch the wedding here” whereas other suggested we “Come here for the after party!” We watched. And then we partied. And then we went home to watch all the highlights again. Emma’s attempt at opening a soft-boiled egg. Fail. Tan Like The Royals. U-huh. Spiderman. In the tube station. Wtf. Love the picture and so happy that you’re blogging about your trip! You’re such an amazing writer! Use the knife to tap the top 1/5th of the egg. The goal is to take the top 1/5th of the shell and the white of the egg off. Then you can dip bread into the egg to break the yoke. 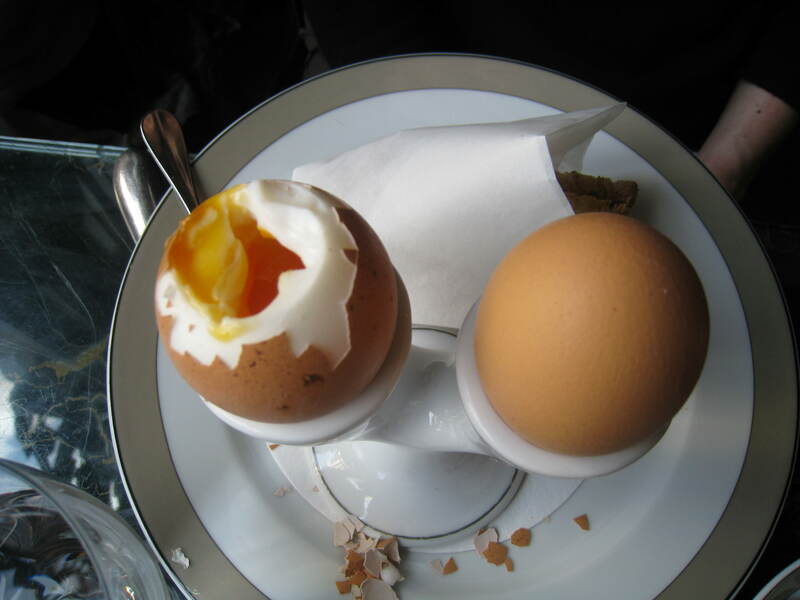 Keep dipping and then use the spoon to scoop out the bottom and side white part of the egg. Fantastic! I’m going to try that method this weekend! Anything has to work better than my way! “I can’t say that this endeared us to the regulars but I can safely say that we will be remembered.”….INDEED!! (We do that a lot, don’t we…). Hmmmmm… xo! We do! That’s how we roll. Miss you guys!